You've found the “Canada Percheron Horse Breeders” page here at Hobby Farm Wisdom! If this is the first time you have visited our site: Welcome! Originating in western France as far back as the 17th century, Percheron is a breed of draft horse. Today, it is the most popular breed of draft horse in France. These horses are typically gray or black in appearance, although the United States also accepts roan, bay and chestnut variations with a small amount of white on their head and feet. The accepted size of a Percheron varies by country. In the United States for instance, Percherons are between 66 – 71 inches. They are heavily muscled, easy to care for and adapt well in many different climates and conditions. Percheron horses were originally bred as war horses and have a reputation as very intelligent and willing to work. They are still used predominately as draft horses; the largest team of working Percherons in Europe is found at Disneyland Paris, where they pull trams on the main street. Can’t find the right Percheron Horse in Canada? Check in: Minnesota, Wisconsin, Michigan, New York, or Washington. 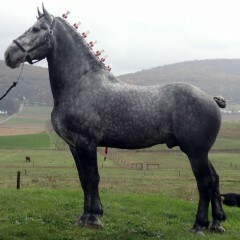 Or, to see a list of ALL the Percheron Horse breeders in the US: Click Here!